Pakistan were coming into the series after defeating Australia 3-0 and thus winning ten T20I series consecutively. Riding on this confidence wave, Pakistan would have wanted to start the series with a bang. New Zealand, on the other hand, haven't played an international match for seven months. The venue for the match was Sheik Zayed International Stadium, Abu Dhabi. Pakistan won the toss and elected to bat first. Shaheen Afridi was replaced by Usman Khan, the only change to the Pakistan side from the last match that won against Australia. New Zealand were without their star opene Martin Guptill and all-rounder Mitchell Santner. Glenn Phillips was roped in the place of Guptill and Ajaz Khan was handed his T20I debut. New Zealand went into the match with two spinners, two fast bowlers and two medium-paced bowling all-rounders. Babar Azam was in a terrific form, scoring 163 runs in 3 matches with an average of 81.50 and Pakistan needed him to score some runs in order to put a strong total on the board. Babar Azam opened along with Sahibzada Farhan. Pakistan would have loved to get a good start but Adam Milne got the better of Babar Azam in the third over. Sahibzada Farhan was scalped by the debutant Ajaz Patel in his 2nd over leaving the team with a score at 10-2. Asif Ali and Hafeez added 67 to the third wicket before Hafeez got out on 45. Sarfaraz Ahmed scored 34 runs off 26 balls and brought the momentum back into Pakistan's favour but Corey Anderson took a diving catch at long-on to dismiss him. Shoaib Malik continued his poor run of form getting out for 8. Imad Wasim's last over flourish took Pakistan to a respectable total of 148. 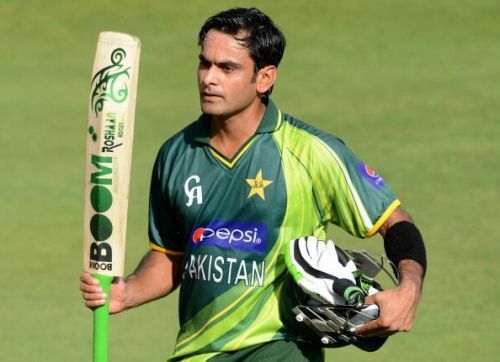 Hafeez scored a crucial 45 after Pakistan were 10-2. Ajaz Patel was economical, giving away only 27 runs and picking up one wicket. Tim Southee was brilliant throughout his spell of 4 overs but the last two balls of his final over accounted for 10 runs. He remained wicketless. Milne bowled well, picking up two wickets in his 4 overs. Grandhomme and Ish Sodhi took a wicket each. New Zealand opened with a new pair of Colin Munro and Glenn Philips and they did not disappoint as they added 50 for the 1st wicket. Glenn Phillips added 12 to the partnership before getting bowled by Hasan Ali on the last ball of the powerplay. Sarfraz brought in Hafeez and Shadab Khan into the attack and both kept the things tight by not giving them runs. Munro, Williamson, and Grandhomme got out in the space of ten runs. Munro scored a good looking 58 off 42 balls, Williamson and Grandhomme scored 11 and 6 respectively. Corey Anderson failed to get the scoreboard ticking with his 12 balls 9 runs and finally got out to Hasan Ali. Taylor's 42 runs off 26 balls wasn't enough to take the Kiwis over the line as Pakistan won by 2 runs. Munro's well deserved 58 went in vain as Pakistan won the match. Imad Wasim opened the bowling attack again for Pakistan and bowled an economical spell of 1 for 26 in four overs. Interestingly, Shadab Khan's figures were the same as figures of Imad. Shadab took the wicket of Kiwi captain-Kane Williamson. Hafeez also bowled an economical spell conceding just 13 in his 3 overs. Hasan Ali took 3 wickets for 35 runs in his 4 overs. Shaheen Afridi defended 17 runs off the last over but went wicketless.